Crown Crates are item bundles obtainable from the Crown Store containing four or five collectibles and utility items randomly chosen from a certain pool. Crown Crates are opened from the Crown Crate UI (default key: F3), which summons Pacrooti. Opening a Crate will result in Pacrooti dealing four (or rarely five) cards, which can then be turned over to reveal your rewards. The pool of possible rewards is called a "Season", and these cycle quarterly. Crates can be bought individually for 00400400 , in a pack of 4 for 015001,500 , or in a pack of 15 for 050005,000 . If a Crown Crate contains a collectible you already own, Crown Gems will automatically be extracted. You cannot, however, extract Gems from collectibles you don't want. Crown Gems can be extracted from unwanted consumables and furniture at any time through the Crown Crate UI. You can only extract consumables obtained via Crown Crates; identical items bought through the Crown Store cannot be converted. 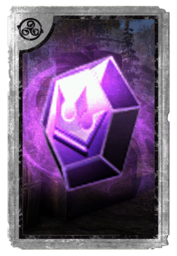 Gems can then be spent in the Crown Store to obtain specific items from the current Season. These are divided into price tiers, as indicated on the individual crate theme pages. Some items cannot be bought with Gems and must be obtained through Crates. The Grand and Major XP scrolls could originally only be won in crates; they could not be bought separately from the Gem Store. Many of the Crown Crate card backs appear (with a different symbol in the center) in Legends as Card Backs. This page was last modified on 26 March 2019, at 16:50.